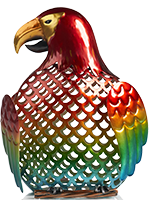 Vibrant, bold colors and delightful details abound on this pretty-pretty parrot! 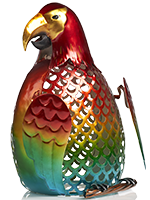 The hand-painted, glossy metal finish features intense hues, intricate cut-outs and bendable wings. This lively fellow doesn't speak but will be the bold exclamation point in any room! Measures 4” diam. x 9.5” h.